On November 1st, at approximately 7:22pm, officers were dispatched to a report of a man on the back deck of a home on Crestview Drive in the Timber Ponds Development. The caller stated she was cooking in her kitchen when she observed a male on her back deck. She opened the door and asked the man why he was on her deck. The individual gave an excuse that made no sense to the resident. The resident locked her back door, set her alarm, and called police. Within minutes several South Brunswick police officers arrived in the neighborhood and began to get a description of the man from the caller. At around the same time Officer Craig Cleffi and Sergeant Michael Kuchma observed a male exit a backyard on Crestview Drive between two houses further down the block from the initial call. The male, who matched the caller’s description, was detained by the officers. 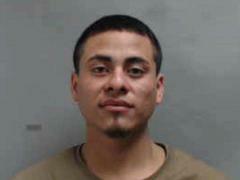 The man was identified as Carlos Betancourt-Carmon, age 22, of New Brunswick. A follow up investigation by Officer Cleffi and Detective Brady Shelcusky determined Betancourt-Carmon had taken a bus from New Brunswick into South Brunswick. He had been walking around the neighborhood when he went into the backyards on Crestview Drive. He was on the rear deck attempting to break into the home when he was confronted by the caller. He was charged with burglary and criminal mischief. He was lodged at the Middlesex County Adult Corrections Center awaiting his first court appearance. Much of this afternoon will remain dry, though a passing shower or two can't be ruled out (mainly after 3 PM). After 8 PM, a few periods of rain and embedded storms move in. Some heavy downpours and brief gusty winds will accompany these storms before they move out near midnight. Additionally, while unlikely, a brief isolated tornado is not completely ruled out with these storms. Tomorrow afternoon, an upper level disturbance will pass overhead and will bring very strong winds along with it. Winds will easily gust 40 - 50 mph (some gusts to 55 mph possible) between 12 - 7 PM. These winds coupled with saturated grounds from the overnight rain increases the risk for downed trees and power lines. Winds weaken tomorrow night after sunset.